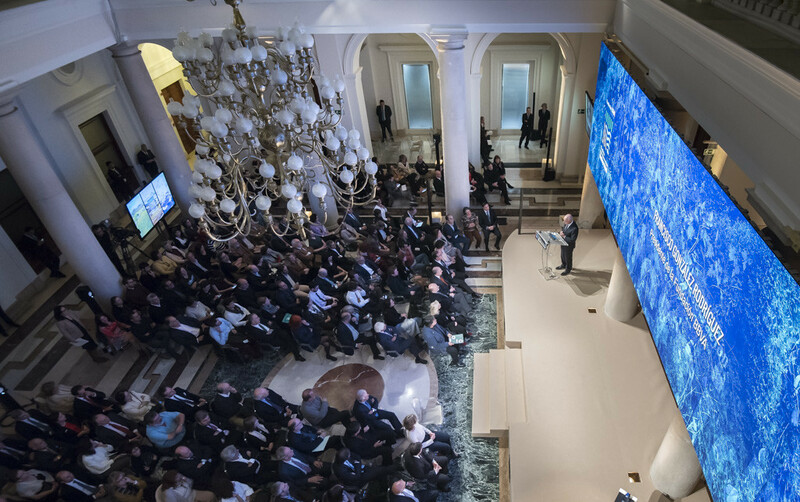 November 24, 2016, Madrid, Spain – Bringing together the leading voices in conservation from Spain, the 11th BBVA Foundation Gala at the Foundation’s Madrid headquarters was a celebration of the impactful work being done to find solutions to climate change and the world’s extreme loss of biodiversity. 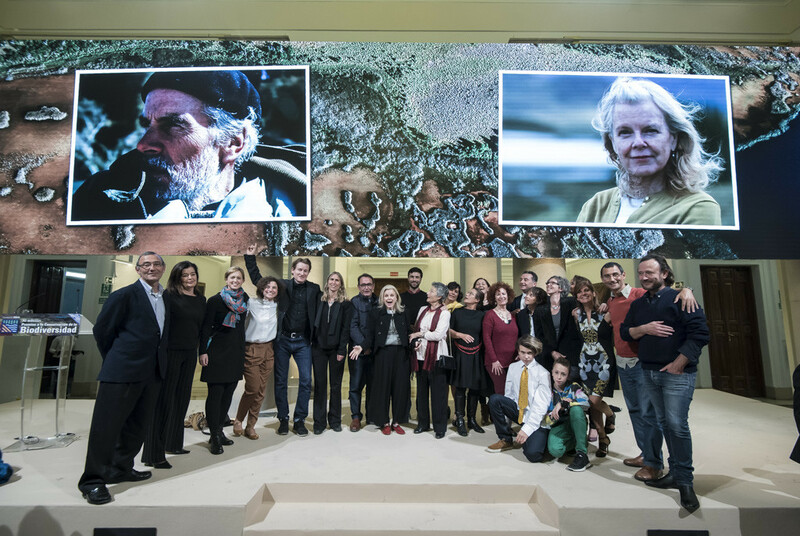 This year’s award was given to The Conservation Land Trust, the NGO founded by Douglas and Kristine Tompkins, for Biodiversity Conservation Projects in Latin America, Group Para la Rehabilitation de la Fauna Autóctona y su Hábitat (GREFA), for Biodiversity Conservation Projects in Spain; and naturalist and sound technician Carlos de Hita for Knowledge Dissemination and Communication in Biodiversity Conservation. 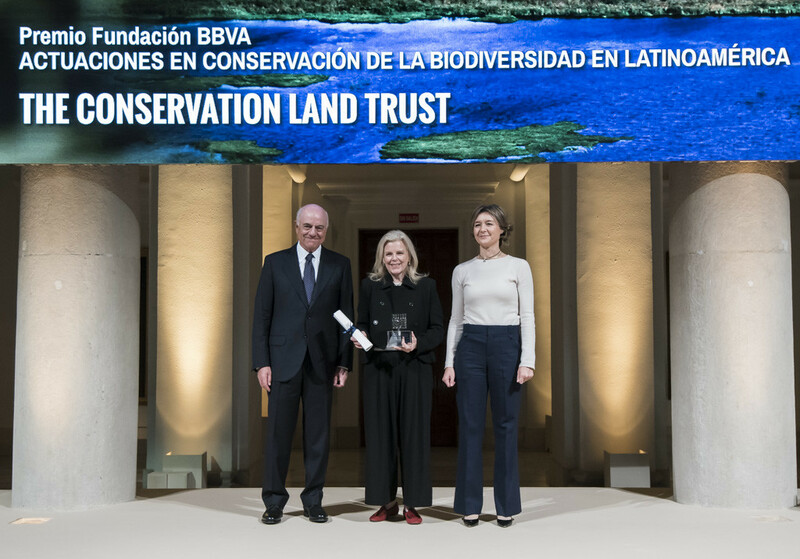 Kristine Tompkins accepted the award in a ceremony led by BBVA Foundation President Francisco González (in the center of the image), and with the presence of Isabel García Tejerina, Minister of Agriculture, Fisheries and Food and Environmental Affairs, and the Director of the BBVA Foundation, Rafael Pardo. 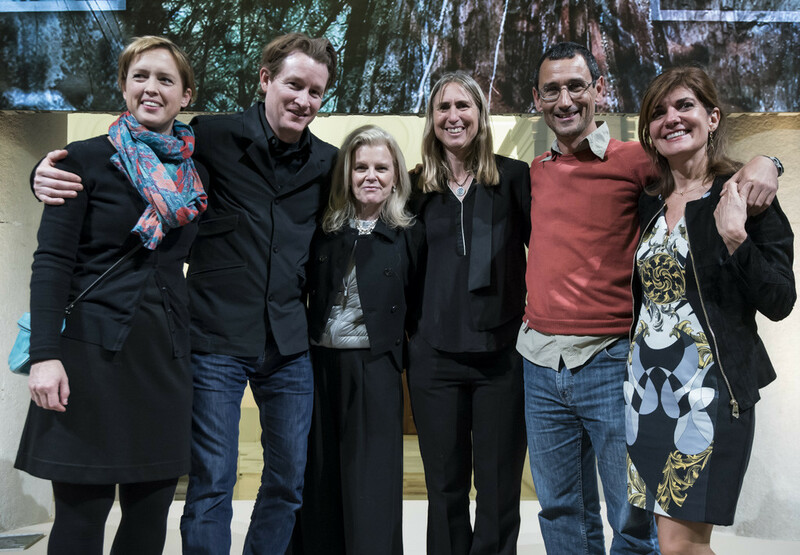 This year Kristine Tompkins and the entities of Tompkins Conservation have been the recipient of several other notable awards including the Global Economic Prize from the Kiel Institute for the World Economy, the 2016 World Tourism Awards at the World Travel Market in London, the Explorer’s Club Lowell Thomas Award, and the Fundación Recyclapolis Award in Santiago, Chile. Kris has been nominated as National Geographic Adventurer of the Year for 2017. The BBVA Foundation Awards for Biodiversity Conservation seek to foster knowledge, action and awareness-raising in ecology and conservation biology by distinguishing individuals and institutions that have marshaled scientific knowledge to implement informed actions on the ground or to influence public opinion by means of outreach and awareness raising. They come with a cash prize of 580,000 euros distributed across three categories: two reserved for conservation projects in Spain and Latin America, and one devoted to biodiversity awareness. Nominees are evaluated by an independent jury made up of scientists, communicators and NGOs. The BBVA Foundation expresses the Corporate Social Responsibility of the BBVA Group, in particular, its engagement with projects to advance the societies where it conducts its business activity. This commitment has given rise to an extensive body of work in diverse knowledge areas. The Foundation engages in the promotion of research, advanced training and the transmission of scientific knowledge to society at large, focusing especially on the analysis of emerging issues in five strategic areas: Environment, Biomedicine and Health, Economy and Society, Basic Sciences and Technology, and Arts and Humanities. The BBVA Foundation designs, develops and finances research projects in these areas; facilitates advanced, specialist training through grants, courses, seminars and workshops; organizes award schemes for researchers and professionals whose work has contributed significantly to the advancement of knowledge; and communicates and disseminates such new knowledge through publications, debates and lectures.